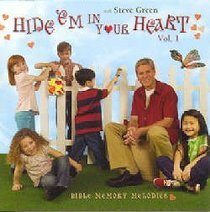 Customer Reviews For "Hide 'Em in Your Heart Volume 1"
If you're looking for a way for your kids (or you yourself)to learn Bible verses, this CD is for you. The songs, which are taken directly from the Bible, will get stuck in your head in no time! It has catchy tunes and is great fun. Highly recommend both Volume 1 and 2.